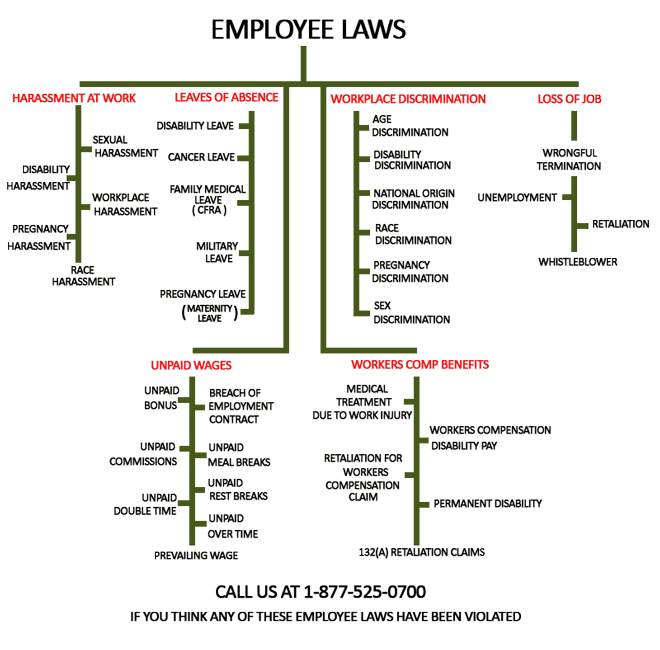 There are so many different types of Employee Laws, firm head, Karl Gerber, created the below chart to illustrate the primary examples of Employee Laws an employment lawyer can use in an employment case. Many California Employee Laws find their origin in the California California Government Code and Labor Code. The California Government Code contains Employee Laws about workplace discrimination and harassment. It also contains provisions concerning leaves of absence for pregnancy, California Family Rights Act (FMLA), and cancer leaves. The California Labor Code contains numerous provisions about unpaid wages. It also contains provisions about safe work environments, and many employee rights. These rights include the right to time off to go to a child’s school, the right to time off if one is the victim of domestic violence, or sexual assault, the right not to be retaliated against for complaining of illegal conduct at work, and the right to disclose one’s wages. The entire California workers compensation act is also included in the California Labor Code. In addition to California Employee Laws contained in the California Government Code, Health and Safety Code (for healthcare whistleblowers), and the Labor Code courts have made Employee Laws forWrongful Termination and unlawful demotions. There is also California court made Employee Laws on employment fraud, promissory estoppel, and breach of contract including breach of employment contract. There are also Federal Employee Laws although for the most part California’s Employee Laws are on the same subject matter, and provide better protection to California Employees. If you prefer to do your own legal research on Employee Laws, you may wish to use our convenient search feature on this website. This site contains articles on most California Employee Laws. For a more accurate legal opinion, and questions concerning California Employee Legal Rights, contact our employee rights law firm at 1-877-525-0700. We have been representing employees throughout California since 1993. 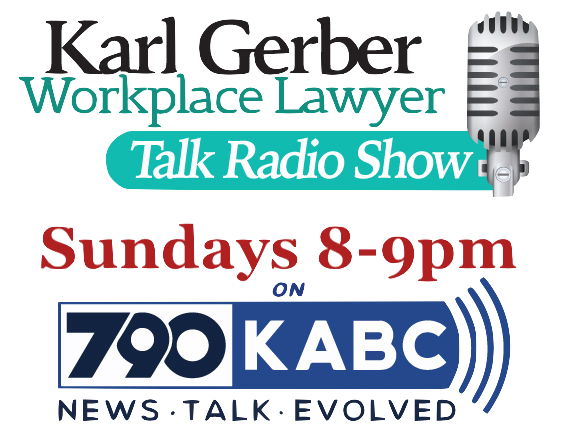 Firm head, Karl Gerber, has handled more than 1,650 employee cases.